Tis the season – for hiring staff! One of the most important things a camp director does at this time of year (or earlier, for some of my more industrious colleagues) is hire all the people who will be the magic makers, dream weavers, role models, and storytellers this summer, aka the camp staff. Hiring staff is huge, it’s so huge in fact, that there are dozens upon dozens of books, articles, and blog posts written about how best to interview, vet, and choose your staff. These are the people who will interact with your campers on a daily basis, they have the power to shape that camper’s experience at camp, so we need to make sure we have the right folks in place. As I was reflecting on this over my holiday break (because, let’s be real, no one in this industry really ever takes a break, am I right?!) it occurred to me that hiring staff is a lot like buying a house. A good foundation is arguably the most important thing to look for when purchasing a new home, it impacts the entire structure of the house, the rest of your house is literally built on top of the foundation and as they say “problems with the foundation will only get worse as you go up”. Foundation problems can lead to water leaks, cracked or bowed walls, doors and windows that are crooked and won’t open or close properly and a bunch of other very costly problems down the road. Unless you’re looking to spend a lot of time and even more money on improvements (that might not even fix all of the problems), stay away from a house with a bad foundation. The most important part of a person’s foundation is the ability to be trustworthy with children. If I wouldn’t feel comfortable leaving someone alone with my campers, then there’s no way to “train that away”. You need to make sure that the person’s value system matches with your camp’s. For instance, if someone holds the belief that the only way to address behavioural issues is through physical punishment, their view won’t match up with any camp’s values or beliefs (at least, geez, I hope not!!!) and since the rest of the ‘house’ is built on that foundation – you can do all the training you want but the problems are only going to get worse as time goes on. So no matter how much training you provide or how many workshops you do, their worldview is going to impact and colour everything they learn. Eventually the cracks will begin to show. Make sure their foundation is sound and in line with your mission and values. These inspections are meant to not only reinforce what you think you know, but more importantly they’re used to discover any hidden problems that you may not have noticed. Maybe the foundation isn’t as good as you thought, or maybe the electrical needs to be updated. None of these experts will tell you not to buy the house, they’ll just (hopefully) give you all the information you need to make an educated decision about your purchase. Do you want to pay big money to rewire the entire house, or should you just walk away? You may decide that putting in a new septic tank is totally worth the cost of getting your dream home. Much like the inspection process of buying a house, there is an “inspection” process that needs to be undergone when hiring staff. You’ve looked at their application and resume, interviewed them and you have a good feeling about their foundation. They checked all the right boxes and seemed like someone you’d want to work with your campers. Now you need proof that you’re right. This is the time when you contact their references to find out if the things they’ve told you check out. You do a criminal record check, a vulnerable sector search, a child abuse registry check, a drivers abstract and any other inspections that you might deem necessary for the position they’re applying for. Hopefully, just like the home, they’ll tell you everything you’re hoping to hear, but there is a chance that you’ll find out their ‘foundation’ is not what you thought, maybe a red flag popped up when you did their CRC or vulnerable sector search – so it turns out that they’re not exactly who you thought they were. It turns out that it’s not worth the risk to hire them. Or maybe their stories don’t line up with their references stories, nothing earth shattering like being listed on a child abuse registry but still, something you didn’t expect, then, like the electrical and septic tank, it’s up to you to decide if it’s worth the cost. Here’s a tip – if there are any red flags with a vulnerable sector search or child abuse registry – run. No matter how wonderful a person may seem, it’s not worth putting your campers or camp at risk. Never. This is the fun part, isn’t it? (Full disclosure – I’m not here yet) There are of course some more costs associated with closing the deal, moving, and decorating the house to meet your needs but this is the most exciting part (or so I’m led to believe… I’ll let you know when it happens). At this point it’s important to be on the lookout for hidden costs and although the house is yours now to make your own, you need to keep in mind that you can’t change EVERYTHING about it. If you decide to do some remodelling remember that not all walls can or should be removed, they could be retaining walls needed to support the structure or they could have wiring or pipes in them so you need to either spend a lot of time and money changing all of that, or learn to live with the wall and make it work for you. Now you can move your furniture in, paint the walls, hang up pictures, and do all the things that will make you feel comfortable and happy in your new home. The last thing to remember is something my parents, who have lived in our family home for almost 39 years, have taught me… that creating your dream home is an ongoing process. It takes time and patience and you should never stop making improvements. As time goes on, trends and tastes will change so updating your home is worth the effort to maintain something so important to you. Close the deal with your staff, hire em! 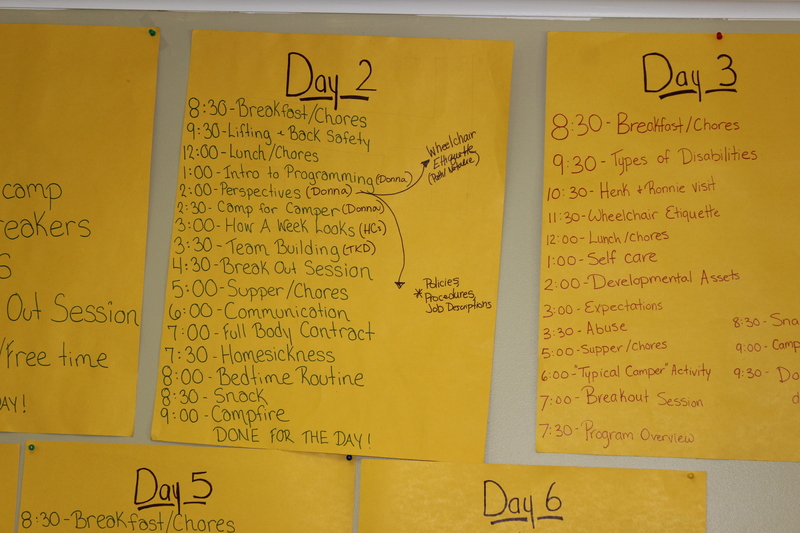 Send them the paperwork, do any pre- training stuff that needs to take place, then move em up to camp and decorate em! Decorating them can very literally mean give them their uniform but it also means training them to be phenomenal camp staff. Knock down those walls of preconceived notions about working with children, and redesign how they communicate with campers and each other, but remember that just like the house, not all walls can come down. Each staff member comes to camp with their own beliefs, ideals, and previous experiences. Someone who’s been bullied in their youth might be a lot more sensitive to how others communicate with them, and you’re not going to “train away” internal belief systems such as morals or values, nor should you want to. You should have hired someone who’s beliefs are in line with your camps. These are the retaining walls that you need to work with and embrace as part of your design. And finally, my parent’s example applies to staff as well, creating your phenomenal camp team is an ongoing process.It takes time and patience and you should never stop looking for opportunities to offer professional development and on the job training. As time goes on and trends in youth development change and we learn more about the business, science, and magic of camp, continue to update your staff development because it’s worth the effort to maintain something so important to you. We’re looking for a “fixer upper” house, something we can spend some time and money on to make it our own. In other words, we’re looking for a house that has potential. I look for potential when I hire staff as well, regardless of how good someone looks on paper, if they aren’t kind, compassionate, trustworthy, reliable, mature and willing to learn then the rest won’t matter. You can have all of the hard skills in the world, but if you can’t be kind then you won’t be a successful camp leader. Alternatively, if someone possesses all of those qualities but doesn’t have much experience, I’m willing to do what it takes to get them the training they need to be successful, because those are qualities you can’t teach. Did you like this post? If so share it on social media and follow for more. Big change or more of the same?